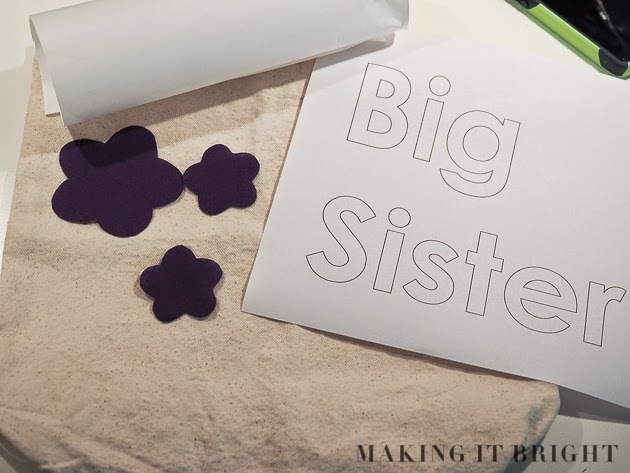 Our niece is becoming a big sister around Thanksgiving. 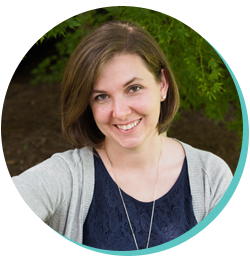 While my kids were visiting with grandparents over fall break, I had time to sit at my desk with my craft supplies and get lost. It was amazing. I decided to make something that would use up some of my supplies and be a useful gift for our niece. 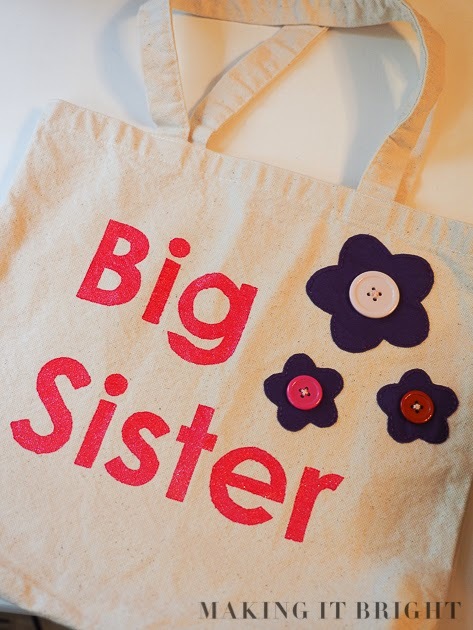 A bag to take to the hospital to visit her new little brother, for her activities and snacks. 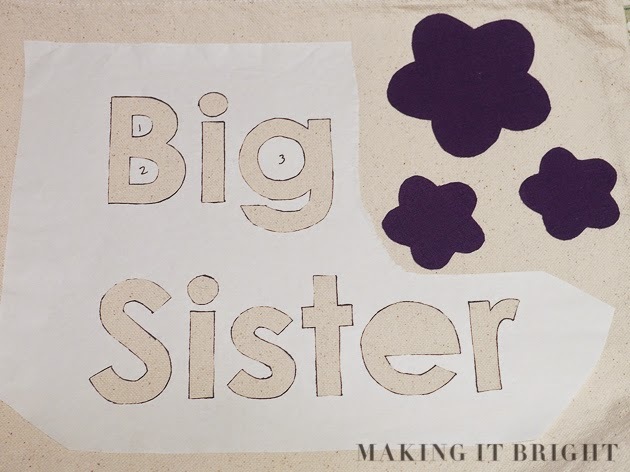 I used a bag that I had in my craft stash and made a freezer paper stencil of "Big Sister". I love freezer paper stencils. The font is Century Gothic in 220 size. Simple but still cute. The flowers are the same clip art I used for my little lady's mended pants (some sized smaller) and backed with fusible interfacing to make appliqué so much easier. 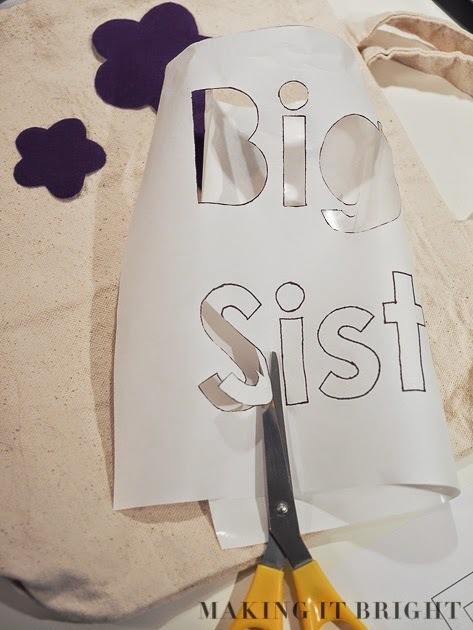 After tracing the "Big Sister" letters onto freezer paper, I slowly cut out the letters while listening to a podcast, saving the insides of the B and G. I accidentally cut the inside of the E in "sister" so I free-handed it with my Pilot FriXion pen. Love those things! After I traced and cut out the freezer paper stencil, I carefully ironed it onto the bag, making sure the letters were firmly adhered for painting. I ironed on the flowers at the same time. I used some Tulip Soft Fabric Paint- Pearl that I had on hand, in Scarlet, to paint the letters. I peeled the stencil away almost immediately because I wanted to see how it looked. Squee! It looked so cute. I actually followed the directions on the back of the paint bottle and let it dry for four hours before handling it. I did a backstitch around each flower and attached a button to the center of each one with embroidery floss. I hope our niece loves her bag, and I can't wait to love on her little brother later this fall.